Do you know how to make Excellent Croissants with minimum effort??? If you do, please tell us!?! 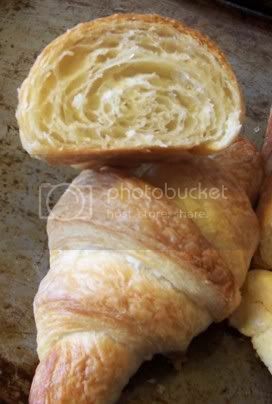 Well, I know it seems like 'easy croissants' is an oxymoron, but I know there must be a modernized and updated and excellent recipe around that some talented 'myth buster' baker has developed! I have tried Julia Child's Recipes, Zojirushi Bread Machine Recipe, looked at REinhardt's, and You-tube, etc., and have reached the conclusion that there are a million different ways to make croissants, so I wonder if anyone has done a real analysis of what exactly you have to do to make a delicious croissant, and what steps you can minimize or leave out completely. I have a recipe for croissants that can be made in one day. I've baked croissants at home a lot of times, so I know what to avoid and what to do. Work in a cold room. Best thing to work on the croissants in the morning when the weather is cool. You can test by holding the butter in your hand. If the butter is malleable and doesn't melt, then it's a good room temperature to work in. If it's too warm or hot, don't bother making croissants. Key thing is to incorporate enough flour into the dough in the beginning and not to add too much flour during the rolling process. Too much flour during the rolling process makes the croissants heavy and crunchy. Use a pinch of flour and then brush off flour from the dough and the table/counter. The dough should be somewhat firm and not stick to the table. I don't let the dough rise prior to rolling. I don't know why, but for some reason, it never works. I just end up with crunchy, bread like croissants whenever I do two rises. I don't let the dough rise prior to rolling. I do let the dough rise after the dough is shaped into croissants though. So I just stick with one rise after shaping the croissants. Get the right dough to butter ratio. Volume-wise for a flaky texture, it's 3 1/4 to 3 1/2 cups flour to 1 cup unsalted butter. When I measure flour, I take a large spoon and use it to fill a measuring cup with flour and then level off the excess flour. Don't use the measuring cup and scoop into the flour because this will measure out too much flour since flour will compact into the measuring cup. Allow enough slow rise proofing in a cool area. It takes about 2 to 3 hours for proofing. Don't proof the croissants in a warm area because the butter will melt. The interior will end up collapsing. Bake in a preheated oven at 475 degrees F for 5 minutes. Then turn down the oven to 400 or 375 degrees F and bake for 15 minutes or so. Make sure the interior of the croissants are thoroughly baked. Don't move the tray for the first 10 minutes of baking, or the dough might collapse. I have two recipes, but they're more or less similar. The recipe at the bottom of the page uses less flour and less butter, so it's less in size and quantity. I use the recipe at the bottom whenever I want to make 6 croissants. Work in a room that is 65 to 70 degree F or cool so that the butter doesn't melt. Usually when I make croissants, I start early in the morning. Working in a cool room will make rolling the dough much easier since butter doesn't melt. Don't make croissants when the room temperature is too warm and hot because the butter will melt during the rolling process. The flaky layers will be lost if the butter melts into the dough. Mix yeast in lukewarm water and let stand until mixture has foam. Measure flour by taking a spoon and filling the measuring cup with flour and leveling off with a spatula. Don't measure by taking a measuring cup and scooping out flour; this will compact the flour into the measuring cup and end up with too much flour. This makes a not so sweet or salty croissants because I tend to eat them with jam or make them into sandwiches. If you prefer sweeter or saltier croissants, then you can double the amount of sugar and/or salt. Mix 3 ¼ cups flour with sugar and salt. Add the yeast mixture and mix. You can also use a stand mixer or food processor to form the dough. Here, I'm mixing by hand. The mixture will look like a dry shaggy mess. Knead the mixture until it becomes a firm dough that doesn't stick to the counter. The dough should bounce back when you poke it. 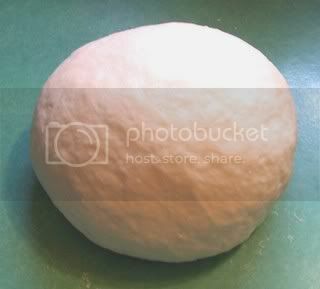 If the dough leaves an indentation, then knead the dough some more until it bounces back when you poke it. Dough should not be stiff nor dry. 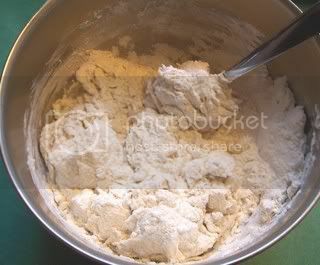 If the dough needs more flour, use some of the flour that you measured from ¼ measuring cup. Some flour may not get incorporated into the dough. That's ok. Just make sure not to add any more flour because the extra flour makes the dough less flaky. Here's the dough that I kneaded. Wrap in plastic and chill in the fridge for 15 minutes. Meanwhile, slice about 1/8" width slices of cold butter. I cut about 14 slices of butter. If the butter is a bit too cold to cut, then let the butter sit a bit longer at room temperature. If the butter is too soft, then chill it. If you want to make a butter block, then you can. I just slice because it's quicker. If the butter breaks, it doesn't matter. Take out the dough and unwrap. Lightly sprinkle the dough with flour front and back. I use a pinch of flour front and back of dough. Brush off excess flour. Make sure to brush off flour from the counter. Don't apply too much flour during the rolling process. I found that too much flour between the layers will produce tough, crunchy layers instead of the light, flaky layers. A pinch of flour is usually enough. Always brush off excess flour from the dough and counter. Roll about a 12" x 12" square. Lay the slices of butter on the center of the dough. Seal the dough at top, center, and bottom. Gently press dough to test the butter. 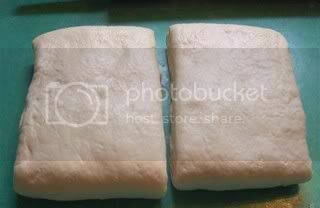 If the butter feels soft, then wrap the dough in plastic and place on a tray or dish and chill it in the freezer for 15 minutes or more until it is malleable. If the butter inside feels like it's firm and malleable, then lightly sprinkle flour on front and back of the dough. Brush off excess flour from dough and counter. Take the rolling pin and start pressing gently down on the dough to flatten it a bit for easy rolling. Lift the dough from the counter to make sure the dough doesn't stick to the counter. If it does stick, gently remove and lightly flour and brush off excess from dough and counter. Start rolling the dough to lengthen it. Every time you roll, make sure to lift the dough from the counter to check that it doesn't stick to the surface. 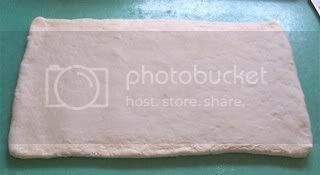 Roll dough to about a 30" x 8" rectangle with a thickness between a 1/8" to 1/4". If the dough sticks to the counter, then lightly flour with a pinch of flour and brush off excess. Make sure to quickly roll the dough before the butter begins to soften. Whenever it feels like the butter has soften, then wrap the dough in plastic and return it to the freezer to chill for 15 minutes. 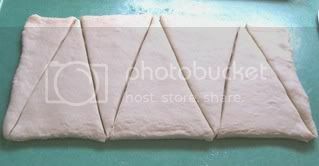 You can gently stretch the dough during the rolling process to ensure a rectangular shape. I usually stretch the corners out. 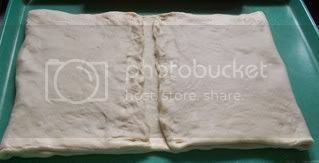 Make a double book fold by folding the top quarter of the dough and folding the bottom quarter of the dough. The edges should not meet at the center. Leave a space at the center to allow space for folding. Fold at the center. Wrap in plastic and chill in the freezer for about 15 minutes to 30 minutes or until dough is firm and well chilled. Take out and let rest for 5 minutes to 10 minutes to let the gluten in the dough relax. Repeat the process of rolling, folding double book fold, and resting in the freezer two more times. In total, there are three double book folds. 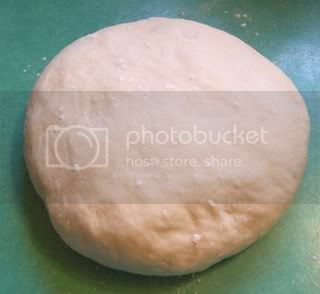 Let the dough chill in the freezer for 15 minutes or whatever time it takes for the dough to be firm and chilled. 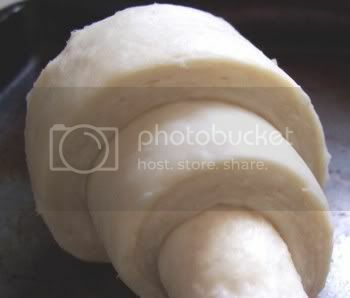 If the dough is frozen, then just let it thaw for a few minutes until it's malleable for rolling. Unwrap. 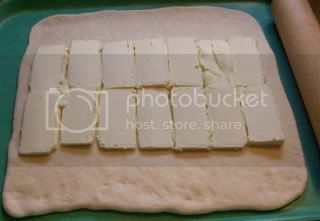 If you have a large table, then you can roll the dough into one large rectangle with a 1/4" thickness. 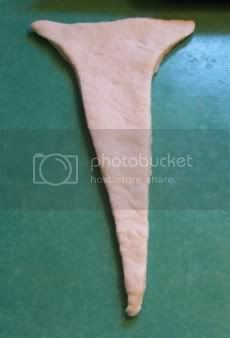 I like to roll half of the dough, so I cut the dough in half. I wrap the other half in plastic and return to freezer. If at any time the dough is too elastic, let it rest in the freezer for 15 to 30 minutes or fridge for 30 minutes to an hour or an hour and a half. Lightly flour and brush off excess flour. Roll to about a 12" x 6" rectangle that is 1/4" . Wrap in plastic and chill in freezer for 15 minutes. 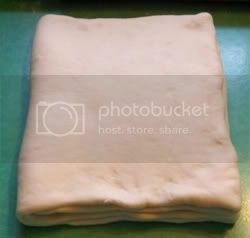 Take the other half of dough and roll into a 12" x 6" rectangle with 1/4" thickness, wrap, and chill in freezer. Take the rectangle out from freezer. Unwrap plastic. Cut out isosceles triangles with a 4" base and 6" height. The triangle should feel cold and firm. 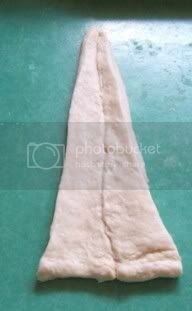 Stretch the triangle lengthwise to about 9" to 10" height. Stretch the base horizontally a bit if it retracts. If the dough feels sticky and soft, then wrap the triangles in plastic and chill in the freezer. If the dough retracts too much, also return to the fridge for 30 minutes to an hour to allow the gluten to relax. The half-triangles are attached at the center. If the dough starts getting soft, wrap in plastic and chill in freezer. Done rolling with the tips tucked underneath. Cover with plastic wrap. If you're afraid of the dough sticking to the wrap, you can lightly spray the plastic wrap with oil. You can brush on an egg wash (beat one egg with 1 tablespoon water). I prefer not to use an egg wash because it browns the croissants too soon. The image isn't that great, but there should be layers of dough and butter. The room was starting to get warm at about 75-77 degrees F. I let them rise for about 2 hours until they look puffy. The rising time will vary. Sometimes it will take more than 2 hours to rise, maybe 3 hours when it's cool around 65 to 70 degrees F.
Make sure not to over proof especially in very hot weather because the butter melts and the structure of the dough tends to weaken, and the croissants collapse with a wet interior during baking. The flakiness is lost due to butter melting. If it looks like the butter is about to melt, then stick the tray in the fridge for a few minutes. Before baking, make sure the dough comes to room temperature and proof first. Gently nudge the side of the dough with your knuckle, if the dough bounces back too quickly, then it's under proofed. The dough is ready to bake when they look puffy. I look at the cut edges and see that they went from being a sharp edge to a rounded edge. It usually takes 2 to 3 hours, and sometimes 3 and a half hours. You can let them rise slowly in the fridge. I've never done this, so make sure to check. And do let them come to room temperature for 30 minutes or an hour before baking if you let them rise in the fridge. It takes about 20 minutes for my oven to get to 475 degrees F. I use an oven thermometer on the middle rack and wait until it registers 475 degrees F. I prefer 475 degrees F because it helps for the butter in the layers to evaporate and create the flaky layers. I found that using a low oven temperature, 350 to 400 degrees F, tends to cause the butter to melt and pool in the pan and the resulting product doesn't puff. Double pan! Make sure that you put another jelly roll pan underneath your jelly roll pan of proofed croissants! I placed another jelly roll pan underneath because it helps prevent the bottoms of the croissants from browning too much. From past experience, when I used one pan, the bottoms of the croissants ended up being burnt. However, if you have a special pan that prevents the bottoms from burning, then one pan is fine. Place double-panned tray on the middle rack and bake at 475 degrees F for 5 minutes. Then turn down the oven to 400 degrees F and bake for 10 minutes. Turn down the oven to 375 degrees F and bake for another 5 to 10 minutes. You want to bake the croissants thoroughly until they're golden brown. Underbaking the croissants causes the interior to collapse. Try not to move the tray during the first 15 minutes of baking. Croissants tend to collapse if the tray is moved around during the 15 minutes because the interior is still raw. The triangle dimension will be a 4" base and 8" to 10" height. Finding this has been a god-send. I've been trying the Julia Child recipe multiple times with relatively little success (can never get the gd things to rise in the last stage) even though I've tried everything. That particular technique takes forever, so it was nearly 9-12 days of evenings down the drain!! This gives me so much hope and I can't wait to try it. I'm going to try making my own butter for it since I'll be able to control the shaping and flavor a little better. I'll let you know how they turn out...thank you again! Start small first with the recipe at the bottom. I always use that recipe since it's easier to roll and doesn't use so much butter. And you could always tweak the amount of sugar and salt if you want them sweeter and saltier. 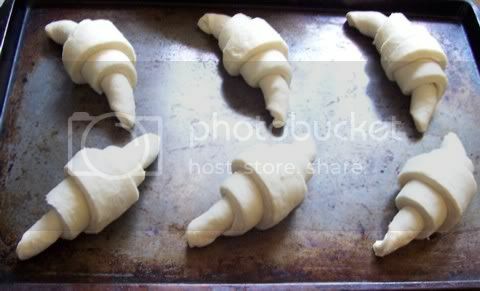 Absolutely splendid photos of Croissant dough method! I immediately read thru your posts and noted the pics, and then rushed into the kitchen to put my shaped croissants into a cooler place to proof so that the butter doesn't melt! So immediately I profitted from your tips. Later in the week I will definitely try your recipe. In the meantime I will look at the videos. Again thank you for taking the time to post this step by step on croissants. I think it is fairly new material to TFL. I searched here for tips/instructions first and didn't find anything as helpful as the recipes and observations you shared. You're welcome. I lurked here for a while but haven't registered until today. Proofing in a cool area for a slow rise is best. It might take a while until the dough gets puffy looking. Just ask here if you need some tips, help, or suggestions. Took me forever, with lots of trials and errors, to figure out how to make light flaky croissants. and the directions are great, shall have to try these, but will wait a bit longer in order to have the cooler kitchen! I should be able to proff these in the basement though as its a lot cooler than my kitchen! 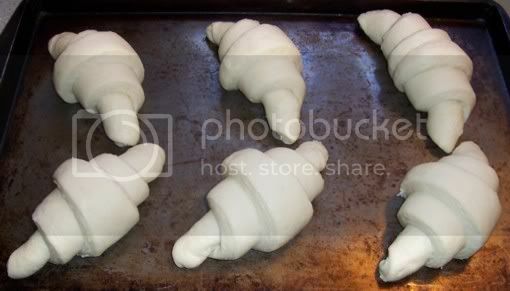 Please let me know how they come out when you do make croissants! This was the first croissant recipe I tried and I fell in love! I was longing for a croissant similar to those I had in France that flaked all over and had buttery layers. Thus fit the bill perfectly! I decided to try a more traditional recipe using milk and a bit of butter in the recipe and finishing with an egg wash. I was so disappointed. They were a bit tough, crunchy but not super flaky. 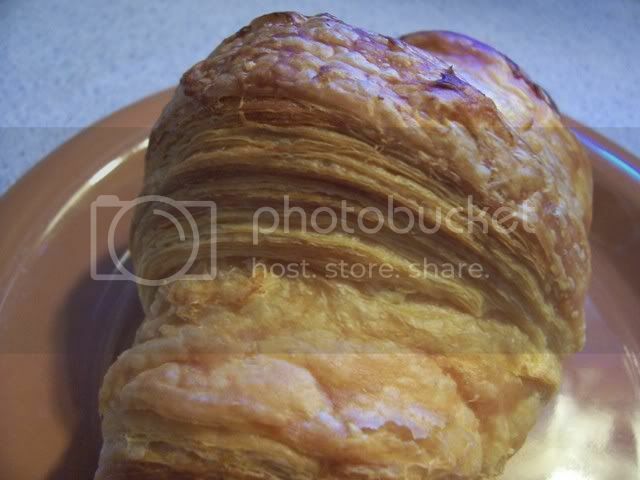 So today I will be making this recipe again to fulfill my croissant craving. Thank you so much for posting this!